This is a 2-page layout that I made last summer. 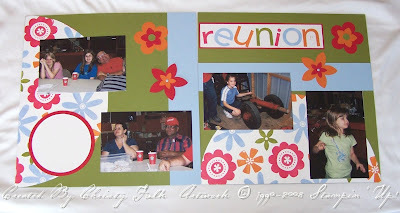 The pictures were taken at our annual Fulk Family Reunion. As you can see by the blank circle on the left, I haven't had a chance to do any journaling yet. Hopefully I can do that soon. I love using the Ginormous Flowers set (p. 95 in the catty) and the Blooms Die-Cuts (p. 166) on scrapbook pages. They were just made for scrapbooking! I hope you like these pages, and get inspired to scrapbook some pictures soon! Supplies: Ginormous Flowers & Big Deal Alphabet Sets; Old Olive, Real Red, & Whisper White cardstock; Soft Subtles Textured 12" x 12" cardstock (Bashful Blue); Real Red, Bashful Blue, Pumpkin Pie, & Old Olive Classic ink pads; Blooms Die-Cuts, Soft Subtles Brads, Coluzzle Starter Kit, & Stampin' Dimensionals.